Towering canyon walls stand on either side of you. Wading upstream, you travel through a river in ankle to waist deep waters. 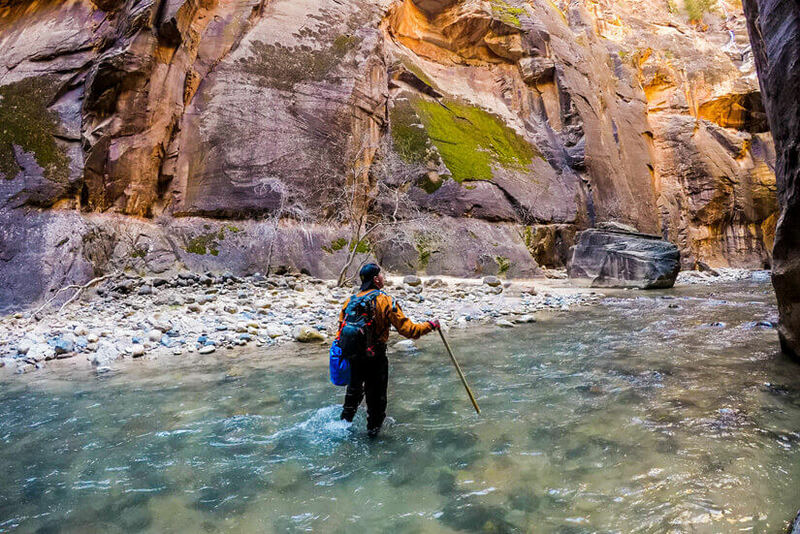 A walking stick in one hand keeps you steady, while a snug dry suit keep you warm from the icy water at your feet. That’s what we found while hiking The Narrows in the winter, and this trail in Zion National Park was every bit as stunning as we imagined. We were invited to St. George, Utah, by TravelMindset for the #InstaMeetStGeorge with Visit St. George. During our long weekend in the region, we explored several hiking trails that are perfect winter adventures. We had a wonderful time hiking the unexpectedly awesome trails at Snow Canyon State Park and Red Cliffs Desert Reserve. But, the hike we were most excited about? The Narrows at Zion National Park. It’s a hike we’ve wanted to tackle ever since we hiked Angles Landing several years prior. The Narrows is located in the narrowest part of Zion Canyon and the Virgin River that runs through the canyon is the trail for the hike. You can hike the trail year-round, but due to the chilly water conditions in the winter, you will find less people than you would in the summer. 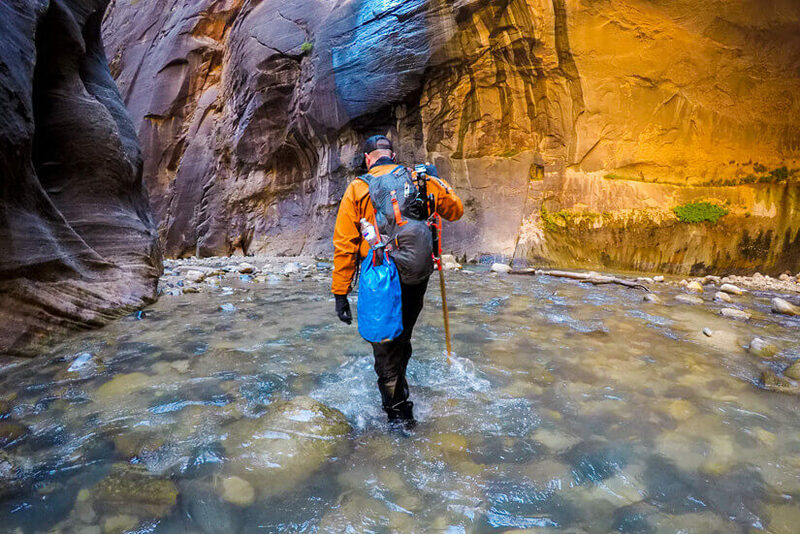 Thankfully, if you decide to venture into The Narrows in the winter, a dry suit from Zion Adventure Co. will keep you nice and toasty throughout the hike. Top Down: You hike the entire length of the canyon,16 miles downstream, from Chamberlain’s Ranch to the Temple of Sinawava. Hiking the trail top down requires a permit—the start of the trail is outside of Zion National Park boundaries and the end point is within the park boundaries. At the end of the trail, you take the park shuttle back to the main entrance of the park. If you decide to hike the trail top down, you can either pack it all into one day, or turn it into an overnight backpacking trip and camp along the way. Bottom Up: Hiking bottom up means that you will enter and exit the canyon from the same point at the Temple of Sinawava. You can hike as far back as Big Spring without a permit. If you want to complete the entire hike, it is 10-miles roundtrip, but you can also just hike in as far as you feel up to and turn around whenever you’d like. The first mile of the trail is along a paved path called the Riverside Walk, and once you reach the Gateway to the Narrows, you have to start hiking in water if you wish to continue. Because of time, we decided to hike the trail bottom up. Our morning started with a 9 a.m. arrival at Zion Adventure Co. We watched a short video about safety and regulations when hiking through The Narrows, and then we checked out all of the gear we’d need for our hike. We were given a demonstration about how to properly put on and wear our gear, too. Each of us received dry suits, water shoes, and a walking stick, and items like fleece leggings, shirts, and gloves were available to rent, as well. Under the dry suit we wore long johns and fleece layers—the number of layers you wear under your suit will depend on the temperatures of the day you are hiking and how cold your body runs. After gathering all of our gear, we hopped back in the car and drove the short mile drive to Zion National Park. Parking in the main parking lot was necessary as we had to jump in a shuttle to take us to the start of the trailhead. Due to heavy traffic throughout the park, driving your own personal vehicle is restricted in certain areas. The ride to The Narrows trailhead is around 45 minutes, so be sure to plan that time into your schedule. Once we were at the Temple of Sinawava trailhead, it was time to gear up in our dry suits. Putting it on prior to this point will get a bit warm, so it’s a good idea to put the bottom half of your dry suit on at the trailhead. The first mile of the trail is called the Riverside Walk—it is a paved path that runs along the river. Once you reach the end of the Riverside Walk, it’s time to put the rest of your dry suit on and get ready to head into the water. When the Riverside Walk trail ends and you reach the water, that’s when the real fun begins! The rest of the trail will send you straight through the river. Depending the recent rainfall and the current time of year, the water could reach your ankles, waist, or even over your head (which would require some swimming!). Generally, during our hike, the water was ankle to knee deep, but there was one point where I passed through waist deep water. And talking about the level of the water, be sure to keep an eye on the weather conditions and alerts before setting off on this hike as flash floods in the canyon can be extremely dangerous. Check with the park rangers before heading out to get up to date weather condition reports. If the water level is too high, flowing too fast, or if there is a risk of flash floods, the trail will close. Luckily, we had a perfect winter day in store for us—the water levels were fairly low and the weather was gorgeous. As we hiked through the gorge, we were amazed by the canyon walls that towered well over a thousand feet above us. At some points, the canyon is only 20-30 feet wide, and because of the curves of the canyon, at times it felt like we had the entire place to ourselves. Throughout the hike, we were in constant awe of our surroundings—it was hard to put the camera down. We didn’t end up hiking all the way to the end of the trail because we spent too much time taking photos, but we did make it partway into the Wall Street section of the canyon. In total, we hiked around 7 miles roundtrip, and we were starving by the time we finished. Hiking through the river is exhausting! Once we completed the hike, we had to take the shuttle back to our car and return our gear. We made it back to Zion Adventure Co. about an hour before they closed for the evening, so we had plenty of time to spare. Then it was time for some grub. We met the rest of our crew at a restaurant down the road, Oscars Café, for a post hike meal. It was a wonderful way to end our adventures hiking The Narrows, and we couldn’t have asked for a better time. Now, we need to head back and give the trail a go from the top down next time! Make sure to pay attention to the current weather conditions. Flash floods can happen, and they can be very dangerous in The Narrows. Be sure to check with a ranger before setting off on this hike. Start your hike as early in the morning as possible. The Narrows can be a full day hike so arriving early will give you time to relax and take photos, plus you have a chance at beating the crowds! Bring plenty of water and snacks. Hiking in the water is exhausting and staying hydrated is always important. We only brought a few granola bars with us and were starving by the time we got back to our car. If you are hiking in the winter, renting a dry suit is a good idea. The dry suit will keep you toasty, and you can hike longer. We got our dry suits from Zion Adventure Co. a short drive from the park’s entrance. Wear layers both under/and over the dry suit. The weather can change quickly in the canyon, so being able to peel off a layer or put one on will keep you comfortable all-day long. Wearing closed toe shoes is necessary. It’s hard to see into the water while you are hiking, and there are lots of rocks, sticks, etc., that you could run into. Bring a drybag for your phone, camera, and everything else you don’t want to get wet. That way, you can bring what you need with you but won’t have to stress and worry that it will get damaged. Taking a walking stick with on the hike is a huge help. It will give you the ability to stabilize yourself on rocks as you walk through the water. I slipped and tripped quite a few times, and the walking stick really helped me keep my balance! Plan in extra time for taking the park shuttle to/from the trailhead. Zion National Park limits car traffic to many areas of the park, so you will need to take the shuttle to reach the start of The Narrows. Keep an eye on the time as you hike. Make sure to turn around with enough time to catch the last shuttle for the day and to return any gear you may have rented. You’ll likely be starving after the hike—Zion Canyon Brew Pub, Thai Sapa, and Oscars are located close to the park and are all great options for a post-hike feast! We visited St. George, Utah, as part of a content project. Special thanks to Travel Mindset and Visit St. George for hosting us on our adventures. As always, all opinions are our own. Looks like quite an adventure! Love the idea! Zion NP being one of my favorite parks (to date), I wish I had known this earlier – but I visited as leader of a summer camp and no such activity was part of the game. My parents go that way this summer, it might be something they could be interested in discovering and doing. I’ll let them know! It such a beautiful place to explore and lots of things to do. I hope I’d get the chance to visit that Zion National Park. 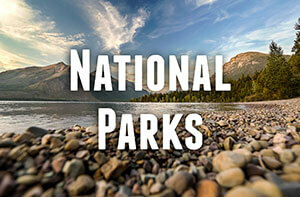 It really an interesting National Park. Thanks for sharing this adventure trips. Hope you can visit sometime soon too! It’s a beautiful area! Looks like quite an adventure! Love the idea! I hope I’d get the chance to visit that Zion National Park. It really an interesting National Park. .Great websites! Thanks for sharing. Yeah it was an amazing hike and Zion National Park is one of our favorites! Enjoyed reading your post. Been awhile since I have been to Zions and I did hike but mostly on the main tourist trails. Your pictures are amazing and motivates me to explore more of the hiking trails in the park. Thanks! Thanks, Jerry! Hope you can get out and explore more of the park sometime soon! Thanks! Winter is the perfect time to give it a go! Great article! I have always wanted to visit Zion NP but due to recent life changes it hasn’t happened, yet! You go in to such detail and this really helps out a lot. Thank you for the summary at the end, some of us are at work and have to get to the juicy details in a hurry lol. Keep up the great work! Brian Ronderos recently posted…Ultralight Backpacking Gear Checklist, Pack Your Bag! Wow, what a great post and photos.. they are amazing! 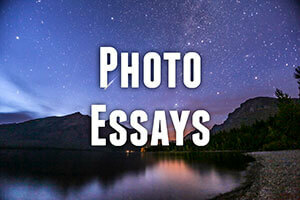 Can I ask you, what camera you use? Thanks, Ethan! We used a Sony A7Rii and a GoPro Hero 5 for the photos in this post.